The first time I saw this film, I was speechless. I knew what to expect from Christopher Nolan, who had been steadily increasing his repertoire for almost two decades. Each of his films outdid the last and built on the already mind-blowing pieces that have gone before them. From The Following (1998) to Memento (2000) to The Prestige (2006) to Inception (2010), I wondered how he could outdo himself with his first foray into hard science fiction. Needless to say, I was impressed by Interstellar (2014) and Nolan’s ability to bring the theoretical and incredible ideas of interstellar travel into an entirely plausible setup. As was the case with his previous films, Nolan manages to bring together almost disjointed moments into a cyclical narrative. Much like Memento, I wanted to sit down and watch the whole thing again immediately after viewing it for the first time, so that I could catch all the little things that lead to the major reveal at the end. Even with a running time of almost three hours, I’d gladly sit through two back-to-back viewings to fully embrace the impact of this film. This is the power of storytelling that Nolan has shown over the years and still maintains today, regardless of genre. While some people would fault Interstellar for its loud music, I feel it is the perfect counterpoint to the silence of outer space. The swell of Hans Zimmer’s score matches perfectly with the power and emotion brought out through the characters. There’s nothing more heart-wrenching than watching a father filter through a lifetime of his children growing up before his eyes in mere minutes. The sheer scale of the film is something I have rarely seen in movies. It makes you truly understand how small we are in the universe. When the credits finally roll, you’ll have laughed, you’ll have cried (a lot), and you’ll finally have a chance to catch your breath. 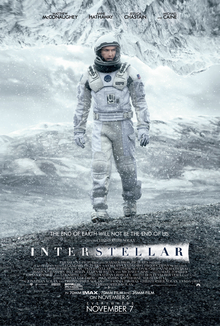 A science fiction masterpiece only Christopher Nolan could deliver, I give Interstellar 5.0 stars out of 5.